This incursion of the Federal Government into the State’s constitutional right to the management of rivers and their water was driven only by politics in a run up to a Federal election. Sensationalist and mostly false claims were accepted and the fact that we were in a very long drought was no considered relevant. Emotional sophistry replaced truth and reason as it was claimed that our rivers were dying as the result of extraction by irrigators and lack of flow in the Murray was the cause of hyper salinity in the Coorong. Claims of dying river red gums, drying wetlands and species loss were repeated with graphic but mostly misleading detail. The Result: Is a Plan that that is costing Governments both revenue and credibility as regional communities across the whole MDB are regressing. The businesses that grow, process and transport our food and fibre are being destroyed by the removal of the vital input of water and the Government inspired racket called the water market. Incredibly, the Plan is badly impacting the environment it is supposed to be assisting and genuine environmental issues are not being addressed. What has happened is the removal of water from thousands of hectares of productive farmland that was also pristine habitat for aquatic species. Much of this habitat is in farmers cropping fields and run-off wetlands established by farmers over several generations. 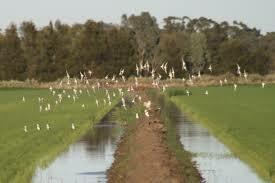 Productive farmland providing pristine habitat for aquatic species. Productive land is being rendered unproductive and as a result uninhabitable to aquatic species as water is removed only to be flushed to the sea, in the mistaken belief that this is beneficial to “The Environment;” demonstrating that those responsible have little understanding of what “The Environment” is. And how much of this nonsense is vastly more complicated due to us having signed up to the various endangered species, migratory birds, wetlands and other international agreements and national and state green legislation? Obama caused huge problems to US businesses with his ridiculous ‘Waters of the USA’ legislation, which Trump is now winding back. When are we going to wake up that these nonsense commitments achieve nothing except lost business opportunities and profits, whilst providing thousands of jobs for green public servants? Turnbull introduced the Federal Water Act ( contrary to Section 100 of the Constitution) under cover of the Ramsar Convention signed in Iran in 1971. It is costing the nation Billions and actually destroying wetland habitat. Heavy flooding like recently up north should be controlled with Channels into excavated large deep holes like open cut Mines, in the flat west, similar to the way the DUTCH do to reclaim Land (POLDERS only in reverse). This would assist and relieve some major flooding, and provide storage. Does this seem plausible. I made this comment and submission when an inquiry was made to preserve water in the western districts, just a few Dozers size D11 7 scrapers, excavaters & $$$$$$ & will POWER!